Writing formulas have been around for a while – and with good reason. 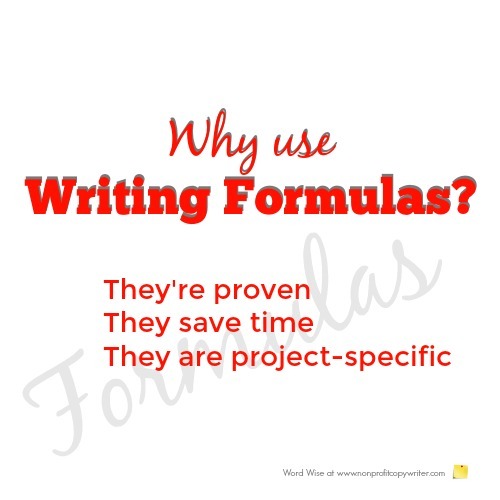 A formula provides a handy outline for you to follow or serves as a self-check as you work on a writing project. And why wouldn’t you use them? Good formulas are proven and have stood the test of time. They’re effective when used by all kinds of writers in all kinds of niches. Plus, formulas save time. If you know what works, use it and prevent guesswork. Like a blueprint, a formula offers structure, guiding you through a writing project in a systematic, organized way. Most are identified with an acronym (“AIDA” or “The 4 Ps”) or as a mnemonic device ("The 4 U's"). The acronym works as a handle to help you remember each formula element, allowing you to order your ideas and present them in the clearest way or with the most persuasive approach. Using Formulas: Is It Cheating? It’s a question that lots of new writers ask because using a formula may seem like copying. But perhaps you need to look at the issue a different way. If you don’t use a formula, you could be in danger of misunderstanding how a particular type of piece is best structured – a pitfall for many a new writer. What may be misconstrued as a mechanical tactic can actually provide a proven framework to make your case and present it more strongly. And on the surface, using a formula may seem counterintuitive to writing in a unique voice. But the fact is that a writer demonstrates creativity by being able to write engagingly within a formula’s parameters. Formulas: Do They Differ from Project to Project? Formulas are project-specific. Dozens of copywriting formulas have been generated for different kinds of writing projects. You’ll follow a different formula for an appeal letter, for instance, but a different one when writing a tweet and yet another formula when writing a long-copy web sales page. In fact, you can find and use formulas for particular elements within different kinds of projects themselves: headline formulas, call-to-action formulas, body copy formulas, and so forth. It’s true that copywriters lean on tested copywriting formulas for sales letters, web pages, ads, and elsewhere, using the most powerful presentation structures to persuade the reader to buy. But some of those same formulas translate easily to use in other kinds of content, apart from sales copy. What about the standard essay formula you learned in English class: introduction, three points, and conclusion? And for you Christian writers out there, don’t forget about the traditional devotional format of scripture-illustration-application. Writing formulas are not just for sales pieces. Use them in any place you can for this simple reason: they work.